FIG. 3 shows the results of the evaluation of the linear splitting property. The vertical axis indicates the width of the sliver. When the torn piece is pulled from left to right, the width remains the same, indicating that the linear rip property is good. A company's PP longitudinal cracking film, characterized by linear cracking, has good straight-line cracking properties, and the 20mm width of the middle strip does not change when it is torn. Shin-Nishi Iwaga's packaging materials "ãƒŸãƒ©ã‚£ãƒ• + OPP", B's PE transverse tear film, and C's PA longitudinal tear film, in turn, showed excellent linear cracking. A company's PE longitudinal tear film is a brother product of PP longitudinal tear film of company A mentioned above, and the crack started to be linear and blocked in the middle. The cracked PET film at the end of D company is a base material that can be opened even without a cut, but there is almost no straight cut. The OPP was introduced as a reference because it is a stretched film that is easily torn if there is a gap, but the tear is strongly serpentine and has no straightforwardness. 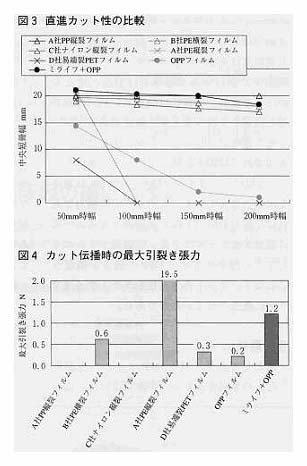 From this result, we can recognize that the non-woven fabric ãƒŸãƒ©ã‚£ãƒ•+OPP The in-line cracks exhibited are due to the effect of longitudinal non-woven fabrics. Figure 4 shows the maximum tear tension during tear propagation, A's PP longitudinal tear film with a straight-ahead split, C's PA longitudinal tear film, and the tear force tester's lowest inductive force tears below From the standpoint of easy tearing, the low tearing force is good, but as mentioned above, excessive tearing tends to cause breakage of the bag and cannot be applied alone, so generally it has a strong material phase. Stacked and used. People can also open Kaifeng smoothly. With this structure, the strength of the OPP, which is widely used as a packaging material, is not impaired, and the longitudinal direction of the notch is made longitudinally by the longitudinal nonwoven fabric. The non-woven fabric ãƒŸãƒ©ã‚£ãƒ•+OPP composite is described as an example. In addition to the longitudinal nonwoven fabric è®ºè¿° described in the text, there are also horizontal woven fabric ãƒŸãƒ©ã‚£ãƒ•, and lateral woven fabric ãƒŸãƒ©ã‚£ãƒ• can be considered to impart lateral straightness to the rip. In addition to considering the use of ordinary film, it can be made into a breathable product by compounding with an open film.